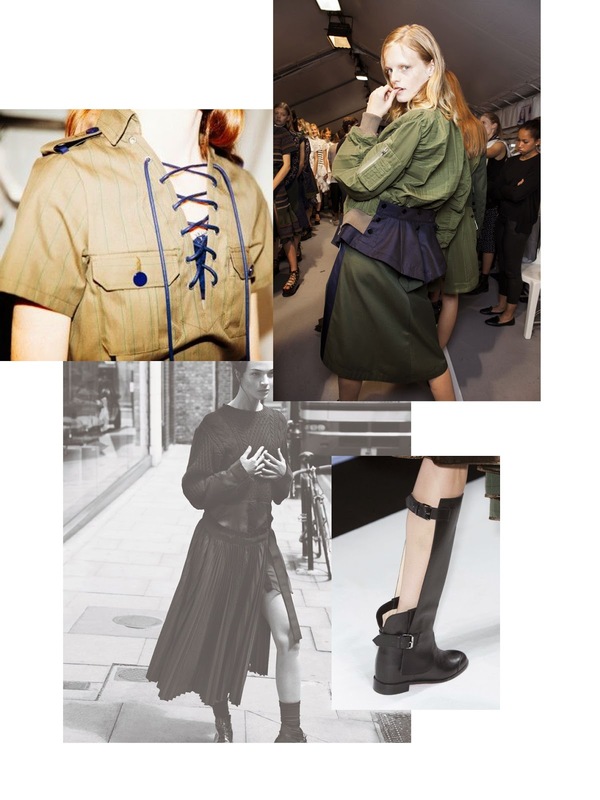 "Military might met flower power on the Sacai. In the hands of designer Chitose Abe, the juxtaposition of each style of dress blended with the other to simultaneously soften and strength their inherent stereotypes. The designer reduced the rigor of khaki military uniforms by, say, folding floral print chiffon into the garment. A navy sailor’s Breton sweater was completed with feminine white guipure lace. And an Airforce bomber jacket was cut in a shapely silk but stiffened up through the use of military officer lapels. When Abe wasn’t beautifully working her core concept, worn with playful platform hiking boot sandals, she was coming up with other winning ideas. The whole man/woman mélange popped up in the final pinstriped business suit looks with chiffon inserts billowing out at seams or cut directly into the linear fabric to break its sartorial rhythm. A little tangent trip into the blue and green plaids of a Scottish kilt was also a worthwhile detour with the grid pattern of the garment reworked and echoed onto lace panels.